1. Designed for people who have bending problems due to bare joints, knees or back injuries. 2. When wearing socks it can effectively reduce the need for bending part of the pain. 3. Save time and effort, even on first use. 4. Continue to pull up until the stockings assistive device is free from socks. Unique three-finger design, flexibility, can easily put socks into the wear socks. Groove-shaped nylon lining, can easily put the foot into the groove. 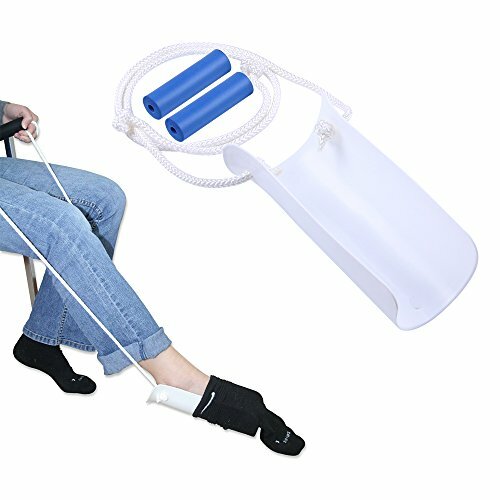 Through the two ends up to 32-inch pull rope and the handle the socks can be easily picked up . Wrapped cloth towel can protect socks. Applicable to any size socks. The surface of light blue nylon, soft and smooth, easy to enter the socks in the foot smoothly, the underlying thick velvet cloth to prevent socks from slipping off.